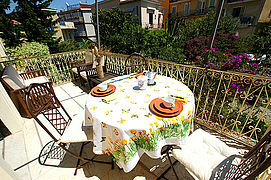 Right in the center of the fishing village of Marina di Camerota, only a stone’s throw from Piazza San Domenico and ca. 400 m from sandy Calanca beach, lies historic and elegant Villa Pomarico. 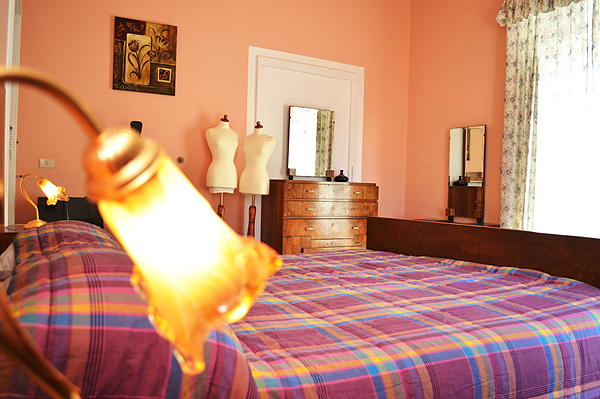 The villa with its two holiday apartments, located on a hardly frequented side road, counts among the most extraordinary accommodations of our Cilento offer. 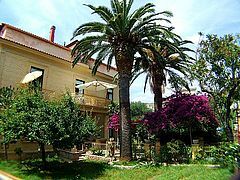 Family Troccoli, the owners who live in the villa, too, has turned the two spacious apartments on the first floor into very tasteful gems. The apartments’ furnishing with elements of Art Nouveau and Biedermeier as well as countless other details is tasteful and appealing and they offer all kinds of conveniences – from high-quality kitchen equipment to washing machine and TV. A particular eye catcher: the ceilings, which are 3.80 m high and partly elaborately adorned. High windows, partly down to floor level, emphasize the airy and bright atmosphere in these two apartments. Felice, ca. 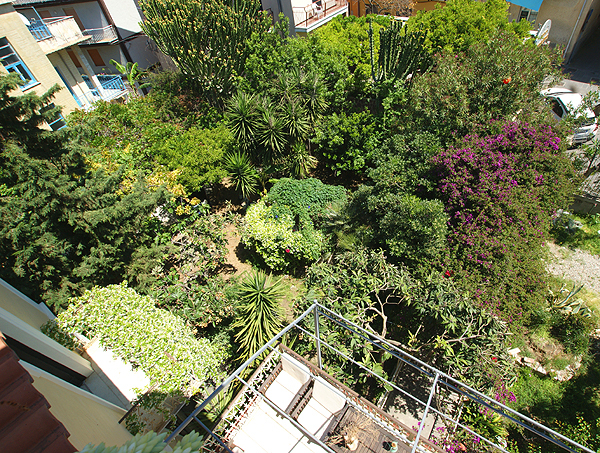 95 m², is the larger of the two holiday apartments. 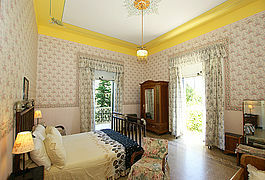 It sleeps 5 persons in two double bedrooms and on a sofa bed in the living area. 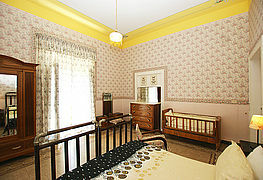 There is children’s bed in one of the bedrooms. The live-and-eat-in kitchen includes a sofa, TV, a kitchenette and dining furniture as well as air conditioning with heating system. 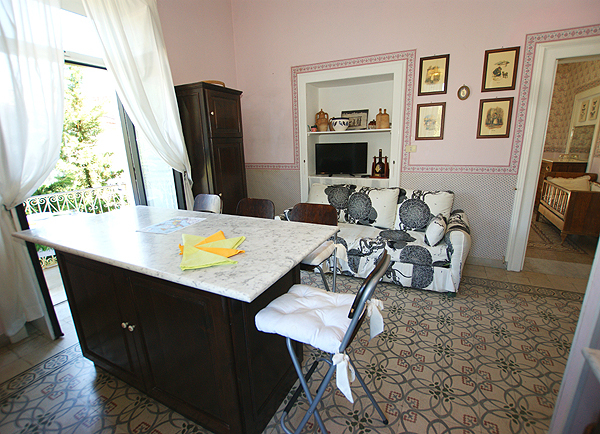 The kitchenette includes gas stove, oven and refrigerator. 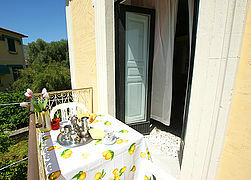 The room opens onto a small furnished balcony. 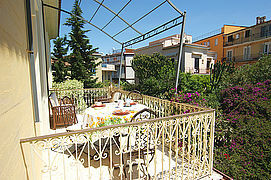 This is, however, not the only balcony; apartment Felice has three more balconies. The largest, which is accessible from one of the double bedrooms, is furnished with comfortable wooden seating accommodations as well as a round dining table and it offers a view of Villa Pomarico’s Mediterranean garden. An awning provides for pleasant shade on warm days. 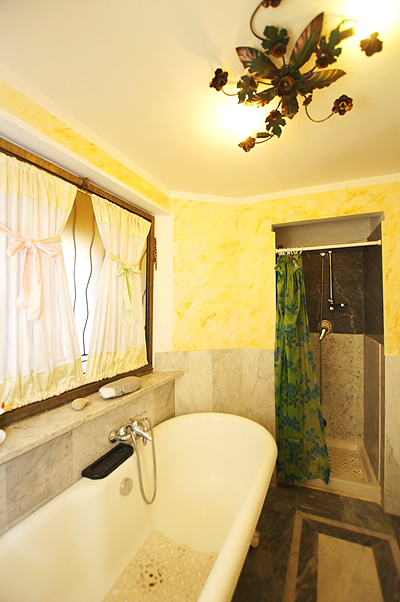 The appealing bathroom is equipped with a claw foot bathtub, bidet, WC and separate shower. 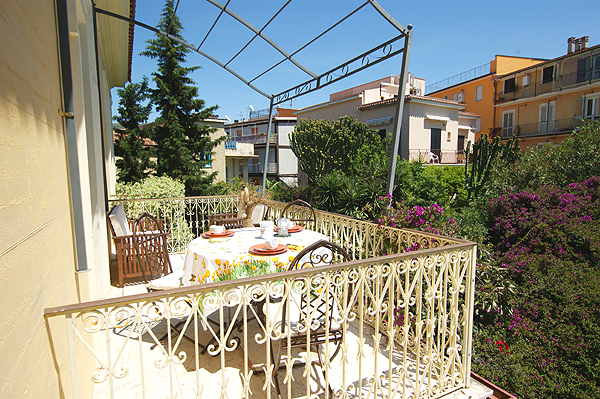 Holiday apartment Emanuela is smaller, ca. 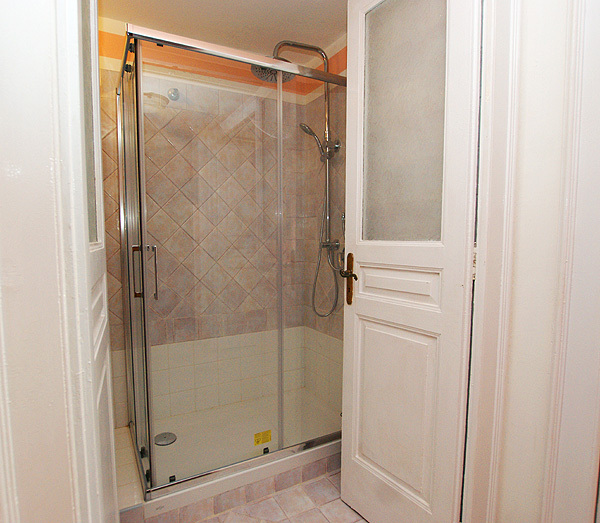 75 m², but it accommodates up to 5 persons, too. It includes a large bedroom (ca. 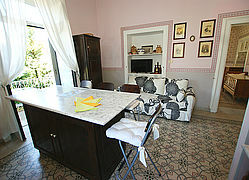 30 m²) with children’s bed, a cozy live-and-eat-in kitchen and a bathroom with WC and bidet and a separated shower cabin. 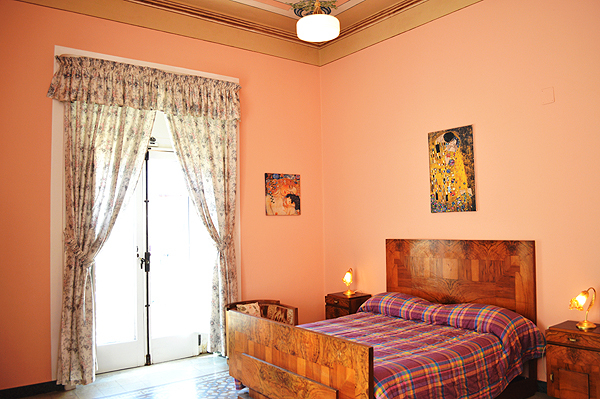 The sleeping gallery (ceiling height 1.40 m) above the live-and-eat-in kitchen is furnished with a double bed. The sofa bed in the living area offers sleeping facility for the fifth person. 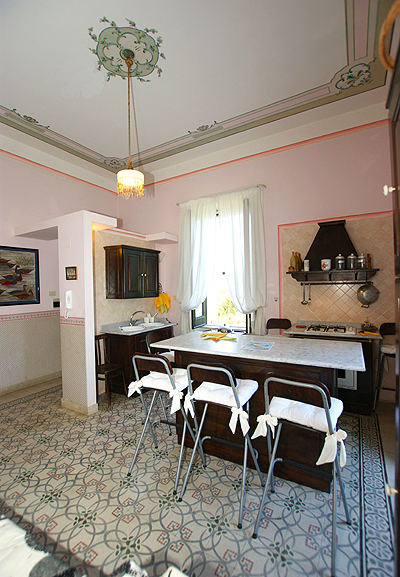 The live-and-eat-in kitchen includes air conditioning with heating system, TV, gas stove, oven as well as refrigerator. The room offers access of one of apartment Emanuela’s three balconies, where a table and chairs invite you to sit down and savor a cappuccino in the Cilento sun. 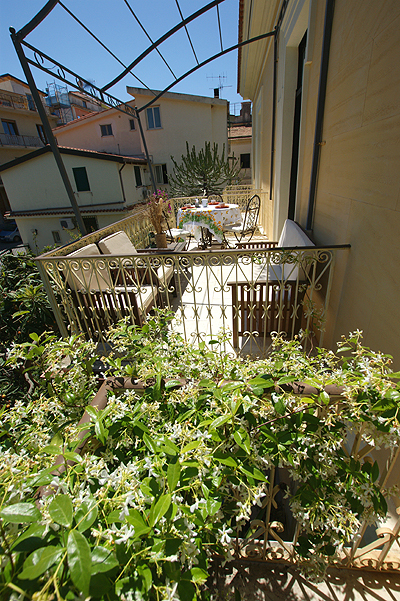 The two other balconies, from where, above all in early summer, the enchanting fragrance of blooming jasmine drifts into the apartments, are accessible from the bright and comfortable bedroom. 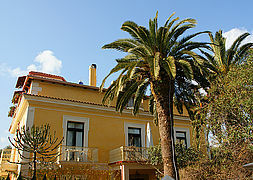 Parking: You can park your car on the fenced property of the villa. 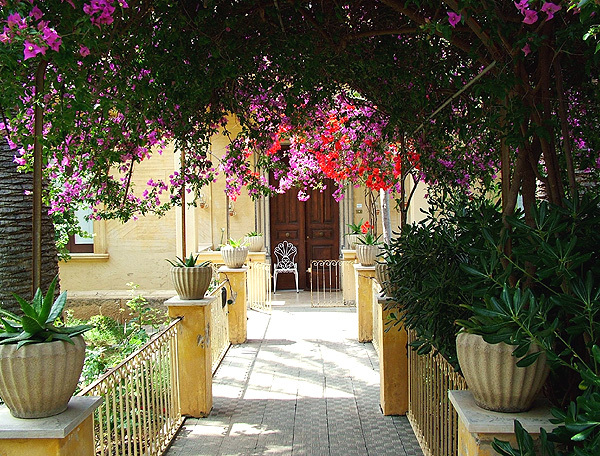 Besides beautiful sandy beaches and hiking trails along the Camerota coastline, there is also a lot to discover in the charming alleys of the Marina. 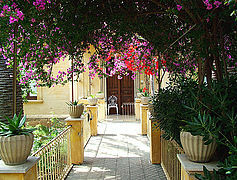 Small shops offering prodotti tipici from the Cilento for sale, excellent fish restaurants, e.g. 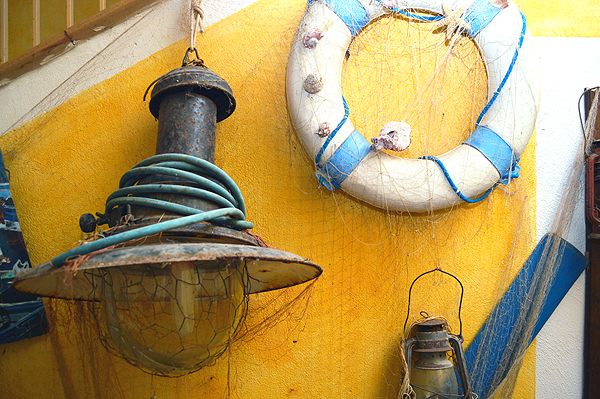 owner Peppe’s Ammor e Mare, and old handicraft are waiting to be discovered. From June to September, various leisure activities are offered at the harbor. Be it sailing, horseback riding or free-diving – the range of activities offered by cooperative Cilento Adventures might add to making your holidays at Marina di Camerota even more fascinating. As early as April, you can go on boat tours to Porto Infreschi with Cooperativa Mare Cilento, which also found at the harbor. 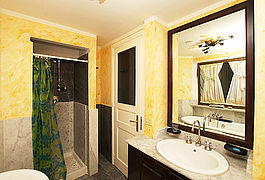 ... with bathtub and shower. <span lang="EN-US" style="font-size:11.0pt; line-height:115%; font-family:Roboto">Thespacious bedroom of holiday apartment Emanuela</span>. 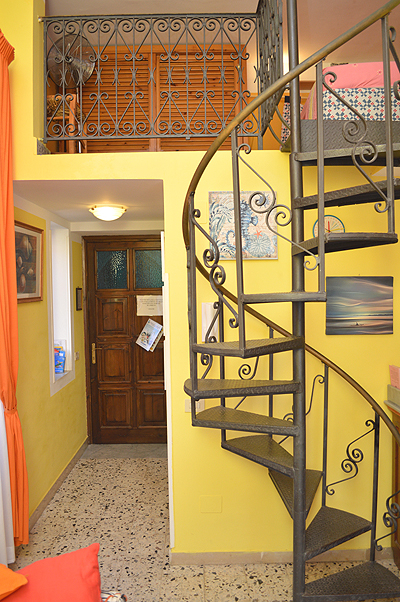 Emanuela: staircase to the sleeping gallery. 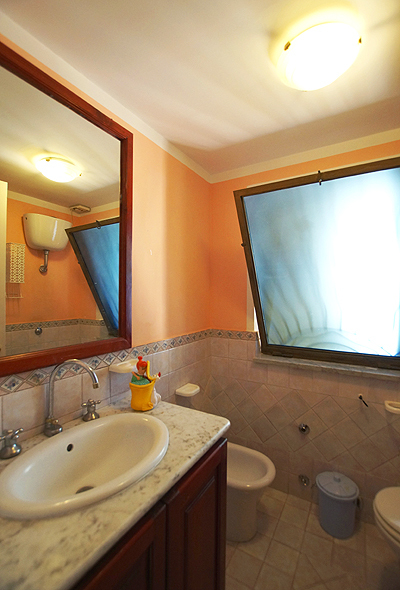 The bathroom at apartment Emanuela. Apt. Felice has altogether 4 balconies. <span lang="EN-US" style="font-size:11.0pt; line-height:115%; font-family:Roboto">Inthe stairwell of Villa Pomarico: obvious signs of owner Peppe’s great love forthe sea and for seafaring.</span>. Die Villa Pomarico hat uns prima gefallen. Die Lage ist einfach perfekt. Von hier aus konnten die wir herrliche Landschaft und das entspannte Strandleben in vollen Zügen genießen. Wir kommen gerne wieder. Zur Unterkunft kann man nur sagen, dass uns einfach alles sehr gut gefallen hat! Die Gegend bietet eine tolle Natur, schöne Strände und strahlt eine freundlichen Atmosphäre aus. Da der Urlaub super war, würde wir gerne wieder zurückkommen. Tipp: Die Autovermietung Callichio. 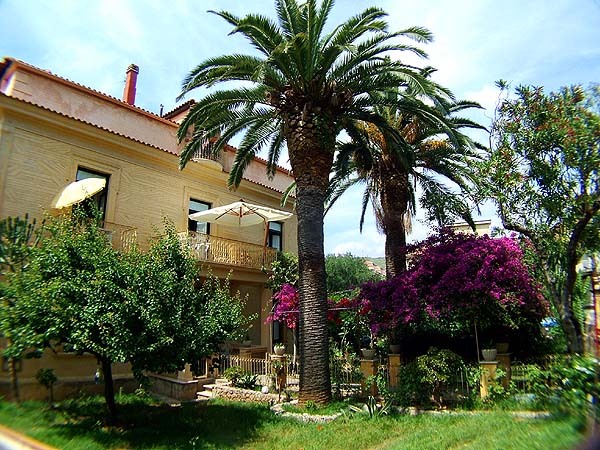 Der Urlaub hat uns sehr gut gefallen, besonders die Wohnung Emanuela in der Villa Pomarico bei Familie Troccoli! Herr Troccoli kümmert sich sehr gut um das Haus, hält es bestens in Stand und steck viel Arbeit hinein. Das Städtchen Marina di Camerota und das Meer sind sehr schön... Empfehlenswert: Essen im Restaurant "Valentone". Wir werden für Sommer 2013 wieder reservieren! Zentrale Lage, Zimmer stilvoll eingerichtet. Schöner großer Strand zwischen Palinuro und Marina di Camerota, abwechslungsreichte Landschaft mit schönen Bergdörfern und fantastischen Stränden. Sehr zu empfehlen ist das Restaurant "Brera" in Marina di Camerota! Außerdem gibt es eine gute Fahrradvermietung in Marina di Camerota: "Bicimania", Via Sirene 14. Diverse Mountainbikes für 15 € / Tag + 100 € Kaution. Wir werden wiederkommen, die Landschaft ist so abwechslungsreich und die Strände schön mit sehr guter Wasserqualität. Schöne Unterkunft in bester Lage mit vielen Balkonen! hübsches Dorf, herrliche Landschaft. Wir kommen wieder, das Wetter war perfekt, die Villa Pomarico prima, die Gegend toll! Flexible days of arrival and departure upon request (in July and August only on Saturdays, no exception made). A deposit of € 150 is due upon arrival. Possible costs for heating are charged on the spot according to use and at cost price. Costs for use of air conditioning: € 30/week (to paid onsite). Max. 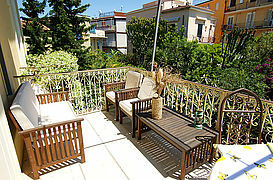 5 persons, 400 m to the sea, 2 bedrooms, Pets upon request.